Creating alanfreed.com was largely a matter of happenstance for Judith Fisher Freed, but now she is fully committed to maintaining the website and educating people about the legendary disc jockey. 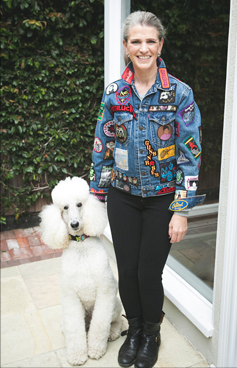 Judith’s interest in the Freed legacy began in 1978, when she started collecting rock ‘n’ roll memorabilia connected with the movie “American Hot Wax,” a fictional account of Alan’s life. Soon after, she found Freed Family scrapbooks consisting of news clippings and family photos. When she started accumulating radio spots, movie posters, lobby cards, as well as documentation from the highly publicized; People Vs. Freed Court case, the archives became of significant importance. When a PBS producer visited Judith’s Los Angeles home to inspect some Alan Freed memorabilia for a music-related program, and opened a goldmine of historic material and inspired Judith to create a better way of preserving it. She called director, Brian Levant, and then in turn connected with webpage designer, Victor Bornia which led to long sessions of scanning photographs and articles to put up on the newly formed website. The establishment of alanfreed.com led directly to VH1′s interest and A Behind The Music television show about Alan Freed aired. Born at Beth Israel Hospital in Newark N.J. in 1956, Judith Lois Fisher was raised in South Orange, N.J. She is the youngest of four children, Judith studied fashion design in college but found herself drawn more to the costuming end of stagecraft. Once she relocated to California, she created the clothing stylist firm ‘Clothestrophobia’ and was costuming musicians for rock videos, album covers and stage performances. On January 23, 1986, at the first Rock and Roll Hall of Fame Dinner, Alan Freed was inducted as a Non-Performer. At the opening of The Rock and Roll Hall of Fame Museum on September 1, 1995, a permanent exhibit, donated by Judith went on display in Cleveland. On December 10, 1991 Alan was honored with a star on The Hollywood-Walk-of Fame. Later, Judith had the honor to cut the ribbon to the Alan Freed Radio Station at The Rock Hall. In 2002, NARAS bestowed the National Trustees Award to Alan Freed. After more than three decades of research of all of the documentation, audio, video and memorabilia of her Late Father-In-Law, Judith will continue maintaining and updating the website. Judith continues her career as a professional organizing consultant with her company, Clothestrophobia.